MyLinlithgow Events Crew. One-off Volunteering. 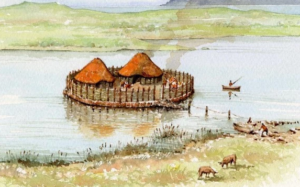 Linlithgow’s origins are lost in the mists of time although there is evidence of early habitation around and in the loch – on artificial islands called crannogs. It is likely that the later habitation grew up around the royal residence. By the beginning of the 12th century a charter of King David 1st reveals that the township was already well established as a burgh. It had a royal hunting lodge and a church, given by King David to the newly founded Augustinian Priory of St Andrews. Malcolm IV and William the Lion (William I) are also known to have lived in Linlithgow occasionally. There was a school established in William’s reign. There are many early spellings of the town’s name which derives from the Gaelic for “loch in a damp hollow”. 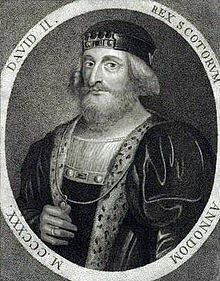 Edward I (Langshanks) visited Linlithgow in 1291 and again in 1296, seeking to assert his authority over Scotland. Several local notables pledged their allegiance to him. In 1298 he camped at the Burgh Muir to the east of the town. This was on his way to defeat William Wallace at the Battle of Falkirk. He stayed in the hunting lodge during 1301- 02 and constructed the “Peel”. This was a fortified wooden palisade on the present day park of the same name. Edward II also stayed here in 1310 but was defeated by Robert the Bruce at Bannockburn in 1314. After the battle, the royal dwelling and Peel were probably returned to Scottish ownership. There is a story that the “palace” was captured when local farmer William Bunnock stopped his hay cart under the entry gate. This prevented the drawbridge from closing. Armed men, concealed in the cart, then subdued the guard. They then occupied the “palace” for a time during Bruce’s guerilla activities. In 1337 Edward III’s English army set fire to Linlithgow. Since the town was largely built of wood this had catastrophic results. Afterwards the town was described as “uninhabited and totally waste”. The town received a royal charter from King Robert II in 1389. This gave the town’s authorities the right to hold markets, claim revenue and administer the port of Blackness. A condition was an annual payment to the king – and the need to patrol the town’s properties every year- the origin of “The Marches. This charter reinforced the town’s importance. During the parliament of David II (son of Robert the Bruce), held at Perth in 1348, it was statute and ordained, “that so long as the Burgh of Berwick, and Roxburgh are detained and holden by English men, the Burghs of Lanark, and Lithgow, shall be received and admitted in their place, as constituent members of the Court of the Four Burghs.” The other 2 members were Edinburgh and Stirling. Linlithgow was also given custody of the standard grain measures – the boll, firlot and peck. In 1349 the Black Death (the plague) reached Scotland and killed a third of the population of Edinburgh. The King, parliament and court took refuge in Linlithgow. Gallows were installed at all the burgh ports. This was part of drastic measures taken to prevent plague carriers from entering the town. In 1989, Queen Elizabeth II visited the town and signed a proclamation to the people of Linlithgow. It was read at a ceremony which re-enacted the granting of Royal Burgh status 600 years before. The town was granted the right to elect a provost in 1540. Henry Forrest of Magdalene was elected and headed up a council of 27 members. This included 4 baillies, a treasurer and 8 deacons elected by the craft guilds. These were the baxters (bakers), coopers (barrel makers), cordiners (shoemakers), fleshers (butchers), smiths, tailors, weavers and wrights (joiners). Fires in 1411 and 1424 destroyed most of the town. In 1424, James I returned from exile in England and constructed a new Palace. He started the work in 1425. The palace was much altered and expanded by successive Kings, particularly James IV and James V. James V presented it to his second wife, Mary of Guise. The brightest star was probably James IV, who saw a ghost in St Michael’s church. The ghost warned him not to go to the battle of Flodden, where he was killed. James VI departed Linlithgow for London in 1603, where he became James I of England. Major incidents in and around the burgh included the Battle of Linlithgow Bridge in 1526. James Hamilton, Earl of Arran, supported by Archibald Douglas the Earl of Angus, won the day against a force led by John Stewart, Earl of Lennox. Lennox surrendered his sword to Hamilton of Pardovan. However he was then ‘murdered’ on the field of battle by James Hamilton of Finnart. This is reputedly near the spot now marked by the Lennox Cairn on the entry to the Kettlestoun estate. 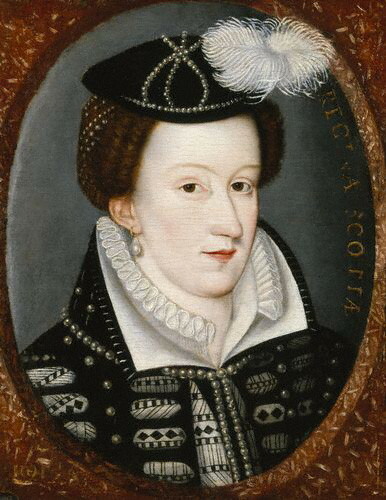 Mary, Queen of Scots, also known as Mary Stuart or Mary I of Scotland was born in Linlithgow Palace on 8 December 1542. She was the only surviving legitimate child of King James V and was six days old when her father died and she acceded to the throne. Mary reigned over Scotland from 14 December 1542 to 24 July 1567 when she was forced to abdicate. During Mary’s imprisonment in England her half-brother, James Stewart, The Regent Moray ruled in her place. He was assassinated in the town by James Hamilton of Bothwelhaugh on January 23rd 1570. This was the first ever assassination using a firearm. There is a plaque on the old Sheriff Court (now Court Residence) commemorating this event. In 1633 King Charles I made an official visit to Linlithgow and stayed overnight in the Palace. For the full story of Mary’s amazing life (and death) please read the separate page dedicated to her alone. In 1650 Oliver Cromwell defeated the Scots at Dunbar and entered Linlithgow in October, installing himself in the Palace. Many of the town’s structures were destroyed in order to fortify the area around the royal dwelling. After the Restoration of 1660 there was much redevelopment. The Town House was eventually rebuilt to a design by architect Robert Mylne. In 1691 Linlithgow had 2,500 inhabitants and the town was engaged in the manufacture of linen cloth. However, foreign trade had declined and Blackness, Linlithgow’s port, had lost out to another local port – Bo’ness. It was given permission to collect all customs dues from shipping. Charles Edward Stuart (Bonnie Prince Charlie) passed through the town in 1745 with his Highland army on the way to Edinburgh. In 1746 Prince William Augustus, Duke of Cumberland and 10,000 troops were in the town. Some were billeted overnight in the Palace. When they hastily left, they failed to put out their campfires which ignited the Palace furnishings. The resulting blaze left the palace in a ruined state. Robert Burns visited in 1787 but was not much impressed by some aspects of the town. He went on to visit a friend, James Smith, who ran a cloth-making works at Linlithgow Bridge. From the 17th century, Linlithgow had a thriving leather trade, involving the manufacture and tanning of leather and shoe making. Almost 300 people were involved in the trade locally. Paper making at Linlithgow Bridge was also once an important local industry. There was also a sizeable whisky distillery (St Magdalene) at the eastern end of the town. A factory was established in Linlithgow by Nobel’s Explosives Ltd in 1902, and named the Regent Works. In 1914 they purchased property at the south end of Provost Road. This site is now occupied by Tesco supermarket. Today Linlithgow is a thriving town with popular schools, a busy railway station and a very popular High Street. This is full of specialist shops, cafes, restaurants and bars. There are also plenty of award-winning real-ale pubs, guest-house and hotels to choose from. The Partnership Centre – the former County Buildings – contains a Visitor Information Centre. The Kirkgate leads from the Cross to the historic Linlithgow Palace and St Michael’s Parish Church. There are thriving local trades centred around Mill Road Industrial Estate at Linlithgow Bridge to the west of the town. International trade is represented by Oracle (formerly Sun Microsystems) on the town’s Eastern edge. Linlithgow’s enviable reputation for good quality education establishments was enhanced by the arrival of Donaldson’s School for deaf and hearing impaired students. It was relocated to Linlithgow from Edinburgh in 2008. 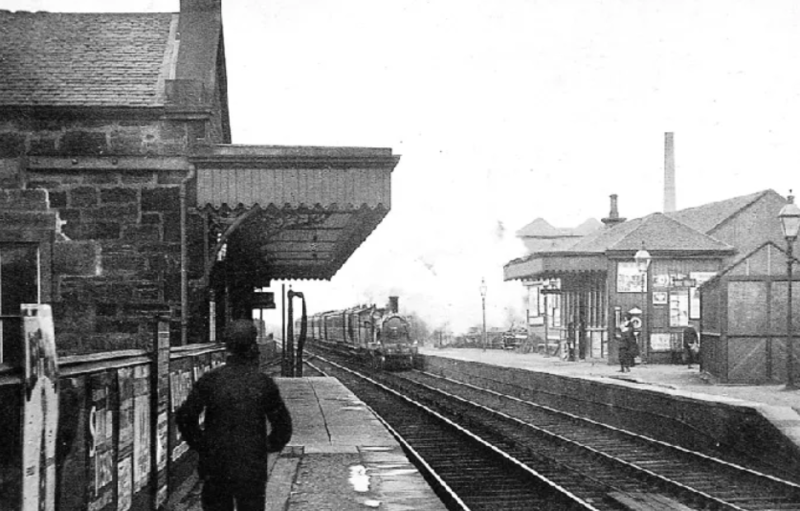 Thank you to Bruce Jamieson, local author and historian for this page – Linlithgow’s Story. 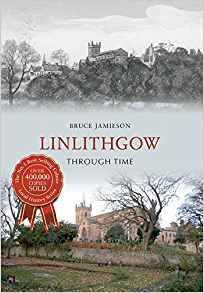 If you would like to learn more about the history of the town, Bruce’s book ‘Linlithgow Through Time‘ is an excellent read and available for purchase. Linlithgow, once the county town of Linlithgowshire, is now the ‘Jewel in the Crown’ of West Lothian. Its medieval palace was once the home of the Stuart monarchs of Scotland and the birthplace of Mary, Queen of Scots. Its population has increased over the last forty years from 5,000 to 15,000 – largely due to its popularity as a commuter town on the rail line to Edinburgh, Glasgow and Stirling. Linlithgow grew around its royal residence and developed from a small market town into an important royal burgh, trading with many overseas destinations through its port of Blackness. With an energetic local population and thousands of tourists visiting its historic monuments and shops, Linlithgow remains a thriving community today. MyLinlithgow is run entirely by grant and donation. Without the generosity of those who have helped so far, this fantastic community resource wouldn't exist. If you can help us to keep the MyLinlithgow website going, even with just a few pounds, please donate to Linlithgow Community Development Trust by clicking on the button below. MyLinlithgow is an initiative of Linlithgow Community Development Trust. Our aim is ‘To make Linlithgow a better place to live and work, through a community led plan of action which provides services, amenities and/or financial support to local initiatives. To find out more about us and our other projects, or to become a member please visit www.trust-linlithgow.org.uk.